Luxury bathrooms have become one of the hottest trends in the last few years and it’s no wonder why – who wouldn’t want a dazzling, opulent bathroom in their home? It makes your trips there much more relaxing and it’ll make your guests feel a little special. Nothing says class quite like a luxury bathroom does. People often pay less attention to the decor of their bathrooms. They tend to decorating and designing the rest of their house with great attention to detail, but seem to disregard the need for this in the bathroom, or else they misfire terribly when it comes to giving said room that extra bit of attention. If you really want to enjoy your bathing time and impress your guests, you should consider giving your bathroom a luxury makeover and make it a spa-like retreat that you’ll be hankering to spend time in. 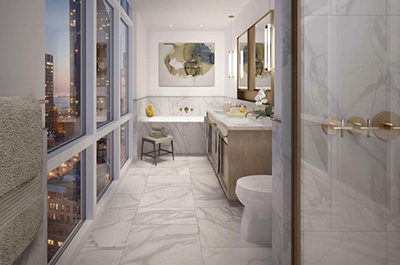 What should my luxury bathroom have? 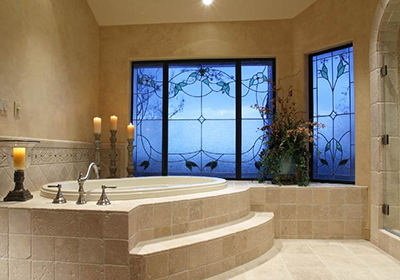 All luxury bathrooms have particular qualities. When you’re shopping around for design ideas, you’ll want to keep some of the following things in mind. · Space: generally, bathrooms are the smallest room in most houses or flats, in to allow for more space elsewhere. Because of this, any larger bathroom instantly has luxury potential. If you already have such a bathroom, your job has become a lot easier already. If you’re renovating, this will give you the chance to expand the bathroom space you’ve been given. If you’re stuck with a small bathroom and renovations aren’t possible, don’t worry – you can still create the illusion of space. Remove all clutter from sight and use a neutral colour palette and many big mirrors. · Light: the right lighting is crucial for any room in your house, but it is especially so in when it comes to your bathroom. Firstly, you’ll want to address the issue of natural light. If you want the room flooded with sunshine, you could fit a skylight or picture windows (with frosted glass, of course). When it comes to mood lighting, you could install a sense of opulence by getting a chandelier fitted – with sconces too. Dimmer switches are a must for ambience. · Floors: if you really want to go all-out, it might be worth going for under-floor heating: then you’ll never feel that shocking bolt of cold rushing up your body when your bare feet touch the floor tiles. As for the floors themselves, stone always looks sleek (and it’s best to avoid things like sheepskin rugs, as bathrooms get steamy). · The finer details: now that you’ve got the general theme of your bathroom down, with the lighting, space and colour and floor, you should amp up the luxury by throwing in some vanity items. If you’re renovating or starting from scratch, here’s your chance to be creative: consider getting a marble-topped chest of drawers and installing a sink in it. For storage, pick out some decorative, tasteful items like bronze statues or silver trays to store your toiletries on. If you’ve blown your budget on renovations and a new bathtub but still feel that your bathroom requires a little more oomph, there are affordable ways you can increase the luxury qualities of the space. Before you buy your accessories, make sure that what you are buying is worth the cost. Consider the space available to you, the budget you’re working with as well as the overall condition of your bathroom. Make sure you check the warranty of the items, too. Obviously, your accessories need to fit the concept of décor and design that you’ve chosen (traditional or modern, for instance). 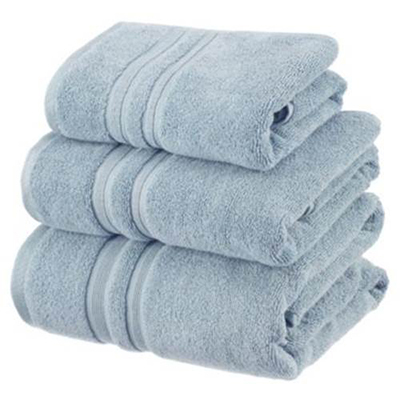 · Towels: big and fluffy is the way forward. Try and choose towels that reflect the colour scheme you’ve gone with for the bathroom. Additionally, consider getting a heated towel rail installed. 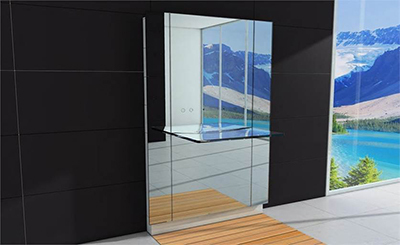 Glass towel warmers in particular look sleek and stylish (they incorporate an electrically heated pane of glass which, amazingly, is usually available in different hues of colour that can match your décor, too). · Faucets and showerheads: make sure these complement the rest of the bathroom fixtures. You could either go for a sleek look, with something like a gooseneck faucet. Alternatively, if you want more of a traditional look, you can opt for porcelain-brass combinations. · Flowers: a little touch can go a long way. Keeping a small vase of flowers in the bathroom can bring a lot in terms of how relaxed it can make you feel, as well as adding colour and life so that the bathroom doesn’t seem too cold and sterile. After you’ve decked your bathroom out with your accessories, you just have one thing left to do: buy some bath oils and sink into the luxurious space you’ve created. Images above are not mine.